Shoreditch Bike Polo Invitational, originally uploaded by I’m Roxy dammit. Direct elimination, first rounds were timed, 10 mins then 15 mins. Teams from Paris, Munich, Berlin, Madison WI, deep rural England, and London. 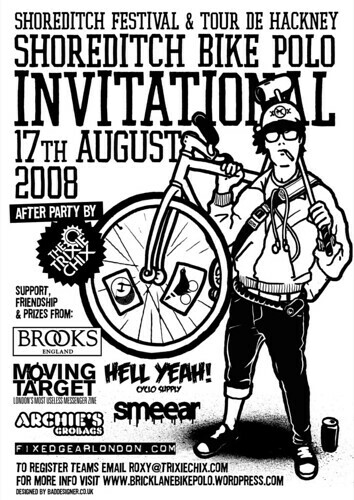 This entry was posted by Doug D on July 31, 2008 at 12:01 am, and is filled under Bike Polo, England, Events-Past, Past Polo Events. Follow any responses to this post through RSS 2.0. You can leave a response or trackback from your own site. Full results image is private. Can you open that up?